I’ve recently had a large deck built by a professional decking company. Only a few weeks ago we began to notice the boards are cupping and twisting. It seems they used two screws in each board at either end, but all the joists in the middle only had one screw. The wood rotates when you walk along it. Is this usual? 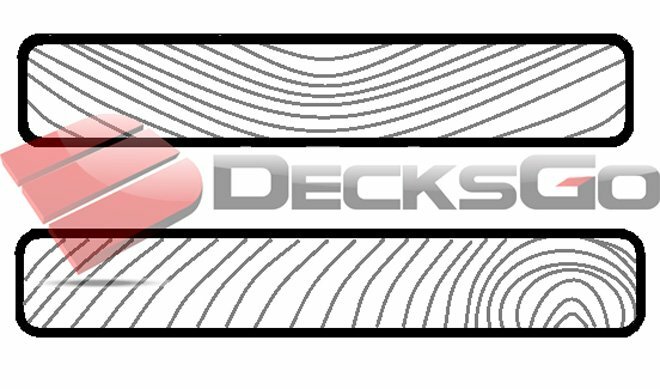 The problem of deck boards cupping is common but it should not be happening! There are a number of ways to prevent this and fix your problem - and make your deck last longer. From what you are describing there could be a few different reasons why your deck is acting the way it is, and the most likely cause is the way the boards are nailed down. This is something that a lot of people have questions about, and so I would like to present you with what you can do to try and prevent your deck boards from cupping, and what to do if they already have! 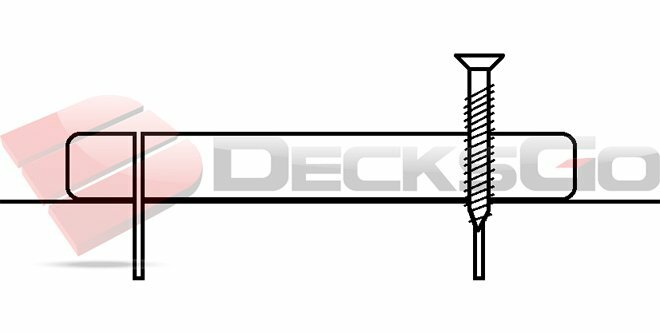 The strongest way to secure deck boards to joists is by using the top down (face mount) screw method. This means using two screws on each end, and using two screws towards the outside of the boards at every joist along the way. Doing this will help keep the boards firmly in place and won’t give it the freedom to warp or cup. If you already have boards that have cupped upwards, you could unscrew and flip each of the boards and rescrew them down. You could reuse that center hole and use three screws to fasten the boards to the joists. Either way, it is important to have at least two screws, one on either side of your deck boards. Another important thing to keep in mind is that you can use longer screws to help hold the boards more firmly in place. We recommend at least a 3” screw with 5/4 deck boards. Looking at the diagram below, the example on the left shows screwing down both sides of the deck board at the ends and at every joist along the way. The example on the right shows screwing down the deck board at the ends with two screws, but only one screw at every joist. This does not secure your deck boards and can allow your boards to move, cup, and warp. Joists are something to think about more as a preventative measure while building your deck, and less as a quick fix after the deck is built. Decreasing the distance between your deck joists means that your deck boards are secured in more locations, span a shorter distance, and help prevent any unwanted cupping or warping. This helps solidify the deck overall and helps hold the structure together more firmly. It is possible to do this once your deck is built, but it would require removing all of your deck joists and starting from scratch. This would be a bit of a larger undertaking than you were expecting. 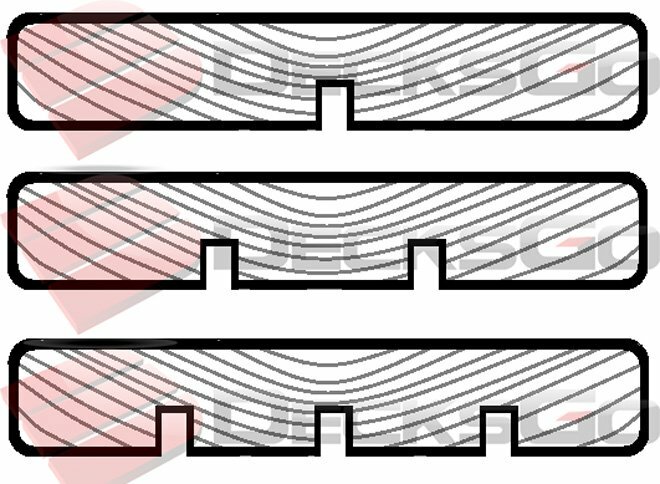 16” is the normal distance as shown in the diagram below on the left, on the right shows the reduced distance of 12” between joists. This means less distance between your screws and keeps your deck boards more secured. NOTE: “on center” means from the middle of the joist and not the edge. When we say 16” or 12” on center we mean from the middle of one joist to the middle of the next. Make sure that the cuts are evenly spaced either one cut creating two halves, two cuts creating thirds, three cuts creating quarters, ect. as shown in the example below. If your boards are 5/4” thick, you would only want to go in 1/2”. It is not meant to go all the way through the board, but to just relieve tension. While using pilot holes won’t affect the cupping of your deck boards, it will prevent them from splitting at the ends. This is important to help the longevity of your deck, and caring for your deck boards. Use them where you would put your screws, especially at either end of your boards. A pilot hole is a pre-drilled hole to help guide your screw. The image below shows it is smaller than the diameter of your screw. It removes some of the wood to alleviate pressure and prevent boards from splitting. 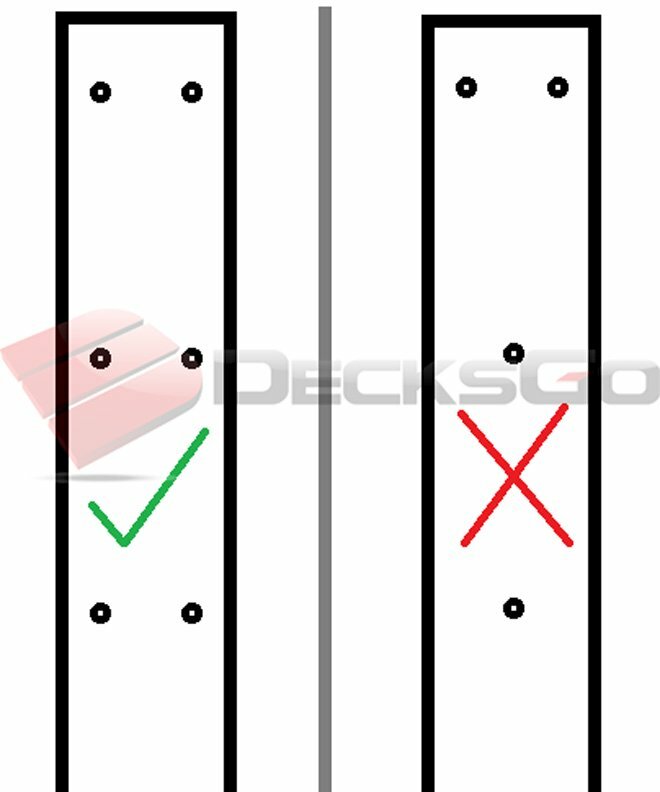 This is especially important at the end of your deck boards. The ends of your deck boards are a little more delicate and have a greater potential to split, if you pre-drill holes first, it will allow your screws to go in smoothly and alleviate the pressure that can cause cracking and splitting. If you look at the next image, you can see how some of the screws have caused splitting from the screw to the end of the deck board. This can eventually cause corners of your boards to come off completely, and stops the boards from adhering strongly to your joists. This is a topic that sparks a lot of debate amongst deck building professionals. Some are absolutely certain that bark side up is the way to go. Here at Decksgo, our experience (and the experience of other professionals) has said the opposite. We know it’s important to put your boards bark side down. The image below shows a deck that was built bark side up and has begun cupping upwards. From our experience, wood likes to stretch and straighten out most along the grain line, so you want to keep your grain lines as short as possible in the wood that you’re using. When looking at the image below, the image on the left shows bark side up, which causes the boards to cup upwards (convex). The image on the right shows that putting bark side down will cause the board to try cupping downwards (concave). This is more difficult to do if the deck boards are secured properly. I’ve left this for last because it goes without question. Your deck will only be high quality if you use high quality materials. Whether you’re using various types of wood, or synthetic materials, your deck can only be as good as the quality of products you use. Below is an image that shows the various types of cuts of dimensional lumber. It shows what part of the log is best to use, and what parts are going to be less stable. Quarter sawn lumber would be ideal, but it’s very unlikely you’ll find it in softwood as it’s a lot of work and most mills won’t cut their lumber this way (it is also expensive to cut lumber this way). You’re most likely to find flat sawn lumber. 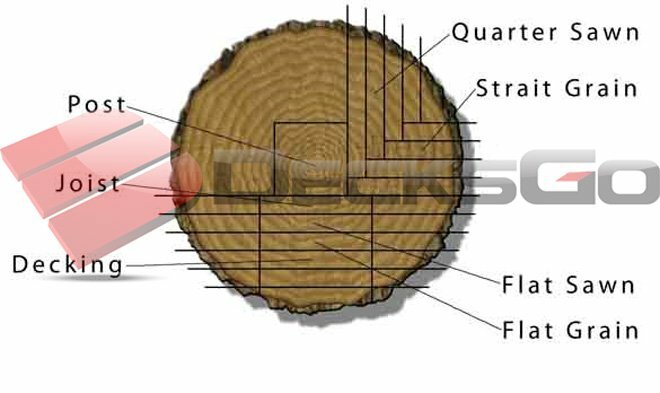 If you look at the grain lines in the image to the right, you’ll see that the flat sawn lumber from closer to the center of the tree have shorter grain lines. This is the type of lumber you want to aim for. The pieces towards the bark (also known as sapwood) have longer grain lines from one side of the board to the other. This will cause your lumber to be more unstable and has the highest chance of cupping and other unpredictable forms of warping. Try to avoid long grain lines through your deck boards. Like the image at the top of this diagram. If you have shorter grain lines you are less likely to have cupping issues. If you have wood that has really long grain lines and is from this outer sapwood part of the tree, you’re better to use the tools and tips given in this article above to secure your deck boards down as much as possible and try and stop it from moving. This is an excellent and thoughtful article with useful observations. My house has 5 decks, which were painted by the previous owner. Three upper decks with redwood boards painted on all sides have much less cupping and splitting than the other two decks. I'm replacing a deck that's closer to the ground and elected to apply two coats of paint to all sides of the decking before screwing it down. I'm doing everything I can to keep the ground dry underneath the deck. I hope this works. I like the idea of the relief cut to minimize cupping; however, it raises a question: will the entire relief need to be treated with and end cut sealer? Thank you. I'm looking at this in mid-2018, but have just put down a new deck surface on an existing structure. The joists are on 24" centers. I know, I know, but I didn't build it and it's sound. I used pressure treated douglas fir, 2x6x144. The wood came in wrapped skids that was very wet from the plant. All well and good. It was put down with Camo system hidden fasteners through the shoulders of the boards with a 1/16" gap. Very important to let wood acclimate to its environment before installing, particularly when the lumber is so green (wet). If the boards have cupped upwards so much and they were screwed down through the upper shoulder how well are are connected to the joists now? Sanding will flatten them out but will you also be sanding down the deck screws? You may have to consider a face down screw and use some plugs if you wish. I think the several boards on my deck are where the builder used a solid 2x8 blocking underneath where deck boards meet at borders. So that the underside has no ventilation. Make sense? That might be part of the problem and it could be exacerbated by the particular species of wood also in that kind of situation. For example, if the would has very large growth rings it will be susceptible to large swings in moisture and humidity whereas a board with tighter growth rings will be a bit more stable. If your builder oriented the 2x8 blocking flat or horizontally between the joists then that might be part of the issue. Generally you can picture frame a deck without having to orient the blocking horizontally as shown in this article. And if it is done this way there is always lots of air flow on both sides of the boards. Amazing that this article doesn't actually address why boards cup! They cup upwards because the side that is exposed to the sun can lose moisture content, even though it has been kiln dried, and shrinks. The side facing down does not the get the same exposure so shrinks *less*. The only option for the board to adjust is to curl. I have *never* seen decking boards cup downwards. NEVER. It does not matter which way the grain goes, and with grooved boards you can't pick and choose based on grain. Fixing properly and maintaining properly is the only way to ensure longevity. Thanks for your comments to round out the conversation. Keep in mind it is not uncommon to see wet deck boards which have been kept indoors and have never been exposed to sun can cup exactly as described in this article. Hi. Is it possible that timber cupping on a deck could be caused by where the srews are placed? This article is immensely useful. It quickly established the right and wrong ways of deck laying. Clearly when done incorrectly the results are disastrous. Thanks so much for posting this. Join in and write your own page! It's easy to do. How? Simply click here to return to Deck Building Forum.